As human beings grapple with the plight of some of the more precious and stunning of the planet’s endangered species – think baby polar bears and Bengal tigers – scientists are also advocating for the growing need to invest time and money to conserve less glamorous ecosystems that support these vanishing species. But whether or not the average person can see past the impulse to commit limited resources in order to save tigers and bears, there is one person (and he says he’s not the only one) who is determined to study what some would consider the lowly seagrasses and thereby save an entire ecosystem and the many species that depend upon it. “We are really concerned about sea grasses declining all over the globe, actually disappearing,” Edwin Cruz-Rivera, associate professor of biology at the University of the Virgin Islands, says. Seagrasses serve as nursing grounds for a lot of fishes, which seems obvious. What is less known, according to Cruz-Rivera, is they also absorb “massive” amounts of CO2, known as blue carbon from the atmosphere trapping it below the sea, thereby reducing the impacts of greenhouse gasses and climate change. And who knows what else these green underwater gardens can do? Cruz-Rivera and UVI graduate student Kaliegh Schlender are going to have a chance to find out thanks to a Track 4 grant from the National Science Foundation’s Established Program to Stimulate Competitive Research (NSF EPSCoR) program. It is the first time UVI has received a Track 4 grant which funds opportunities for non-tenured investigators to further development of their individual research potential through collaborative visits to the nation’s premier academic research centers – in this case with University of California at Davis. The grant will allow Cruz-Rivera and Schlender to spend three months working with department chairman John J. Stachowicz, a renowned marine community ecologist, and his colleagues at the Bodega Bay Marine Lab. What UC Davis’ Marine program has specifically accomplished that Cruz-Rivera hopes to replicate in the Virgin Islands during the second year of the grant is the ability to clone native seagrasses in tanks where the effects of climate change can be replicated in order to observe how the various grasses respond. Events such as the proliferation of destructive, invasive seagrass Halophila stipulacea, which continue to occur here in the Virgin Islands can be observed in a controlled environment in the hope of providing insights for slowing the displacement of native seagrasses or for managing the spread of the invasive species. Queen conch, sea urchins and juvenile fishes rely on sea grass bed for survival. But that is only part of what this grant can accomplish locally. Algae aside, even non indigenous seagrasses are a threat on many levels. If the native grasses die off for any reason, the invasive species could take over, Cruz Rivera, who wrote the grant that secured the Track 4 funding for this research, says. 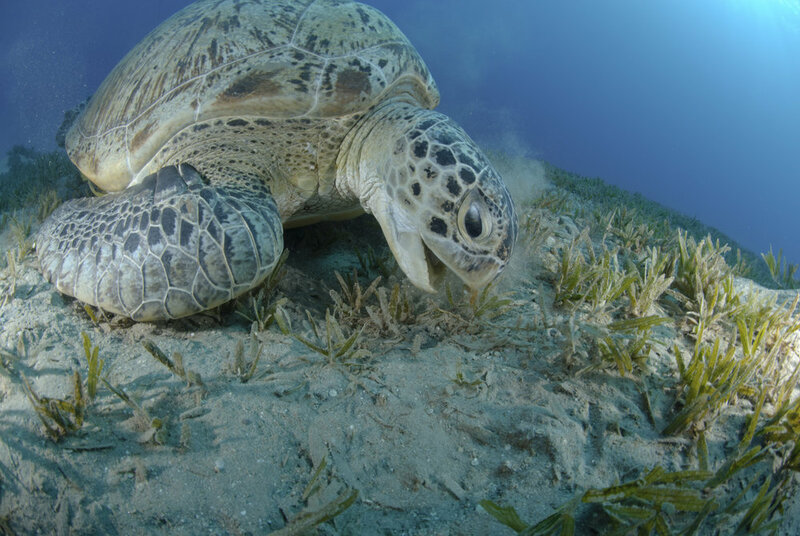 For those concerned about our own very precious turtle population – hawksbill and green sea turtles are on the International Union for Conservation of Nature’s Red List of Endangered Species – experiments run at UVI have indicated native turtle species prefer not to feed on non-native seagrasses or at the very least, will only consider the invasive grasses as a last resort. Another study conducted by UC Davis integrative genetics and genomics Ph.D. student Cassie Ettinger points further to the importance of the ecology journey Cruz Rivera and Schlender will be embarking upon. 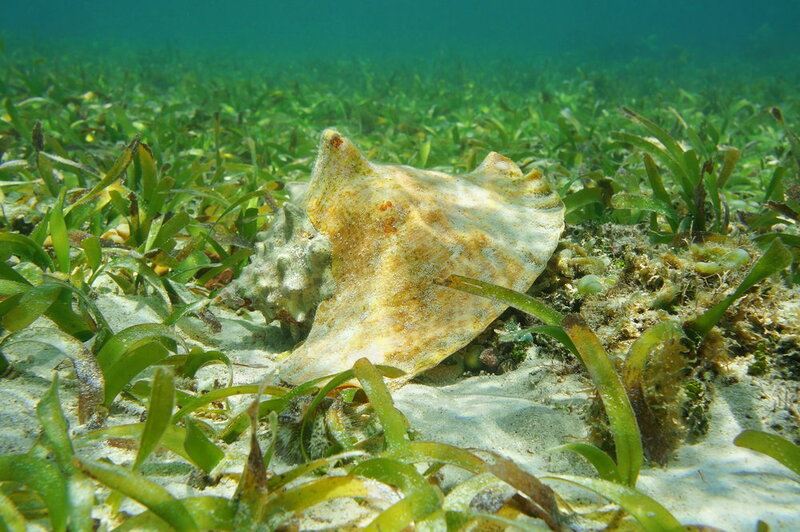 Says Ettinger, “Unfortunately, seagrasses are at risk due to climate change, pollution, and habitat destruction.” Understanding the role of the seagrass microbiome in the environment can lead to a better understanding of seagrass ecology and, therefore, restoration processes. “We believe that seagrasses could be a model system for marine plant-microbe interactions,” Ettinger says. Cruz-Rivera also sees clearly the role of studying seagrasses in a larger arena. Because he understands deeply what’s at stake he is determined to bring what UC Davis has accomplished to bear upon the Virgin Islands marine environment thanks to the support of NSF-EPSCoR. If seagrasses disappear,” he warns, “that changes everything.